Newbowtie | Just keep Going, Trying, Persevering. Because YOU CAN !!!! This is Ronda Bow blogging to you from Cairo. I am having a fantastic time here finding out how people in the 20th and 21st century communicated. It is so foreign and different compared to how the outer-net works in this century. Also, a special hello to my sister and colleague Saffron Smith, Happy New Year and welcome to 3999. I look forward to coming home soon to join you in the celebrations. Until then, this is Ronda Bow signing off. Music by: Kevin Macleod, Name of music:News_Orch_2. rgbstock n.d., Blue cord, viewed 30 September 2012. Does communication only occur when people speak face to face? Are humans the only existence on this planet which communicate? When communication technology fails, to what extent does it affect the human life style? Are humans too dependent on communication technology? This week I am going to talk about social networking sites (SNS). In the reading “Internet Giants can earn with ease” by Paul Sheen, he says this: “No company is safe. No brand is safe. Dominant one decade, irrelevant the next. Adapt or die and former customers will step over the corps”. What Sheen is referring to, by this comment, is how successful social networking sites get replaced at the drop of a hat when something better comes along. Sheen explains this process as “churn”, which is the lack of consumer loyalty to their service provider and moving on with out a second thought. An example of churn can be found in the history of !Yahoo.com. Sheen explains how !Yahoo.com is still to this day making money, but it is only 10 per cent of the value when it was at its height in 2000. Sheen also says that “for all intents and purposes, it has disappeared” (Sheen 2012). Moreover, since 2000 there has been many more comings and goings of social networking sites. Now, in 2012 newest craze “Facebook” is showing some signs of decline. Evidence supporting this claim is also mentioned in the reading by Sheen. He says that a returns poll found that 34% of Facebook users have reduced their time on Facebook over the last six months. The question stands, will Facebook last, or will it to become the victim of churn? This article gives information about churn and how many social networking sites need to keep up with their competitors, if they don’t want to go out of businesses. This survey aims to find out if people are content with their social networking system, how many people read the terms and conditions before creating their account/s. And how many people are aware of some of the shocking terms and conditions relating to Facebook. 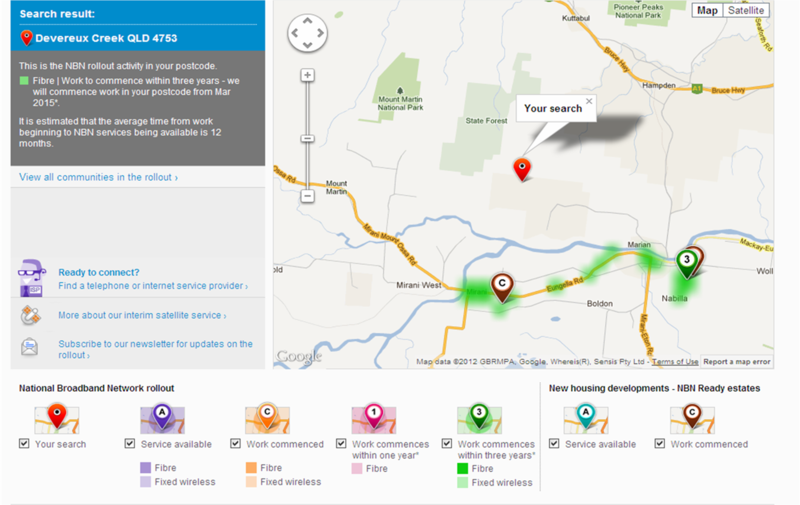 Instead of using surveymonkey.com I decided to use Kwiksurveys.com. I did this because it seemed a lot easier to distribute and construct the surveys. This is the direct like to my survey. Pleas take some time to fill it out and submit it. I sent the URL of my survey to eight people, eight people did them. Question one regarding the terms and conditions of social networking sites. Question three regarding if people were happy with their SNS. Question five regarding how much of the terms and conditions people read before signing up for their SNS. What we can learn from these results is that SNS are not perfect and some people don’t even know what they are signing up for when they sign up for an SNS. This extract from “Burning Chrome and other stories” by: Gibson. W 1995, ‘Burning chrome and other stories’, Harper Collins, London, England, pp 200-201. Is what I will be writing about for week four. I am going to write about a questions raised in the tute. Q1: What is going on in Gibson’s short story “Burning Chrome”? Q2: Identify a sentence that is difficult to understand on its first reading and translate it into English (your own words). A1: Burning Chrome’s plot is rather easy when simplified. Essentially, there are two major characters who are computer hackers. The story is based around the two hackers trying (and succeeding) to hack into the data base of a very powerful money launder called ‘Chrome’. Also, there is another female character called Rikki who both the computer hackers are in love with. But, in the end she breaks one of their hearts by moving countries, and never coming back. A2: The extract in the image above is one that I needed to read a couple of times to understand. 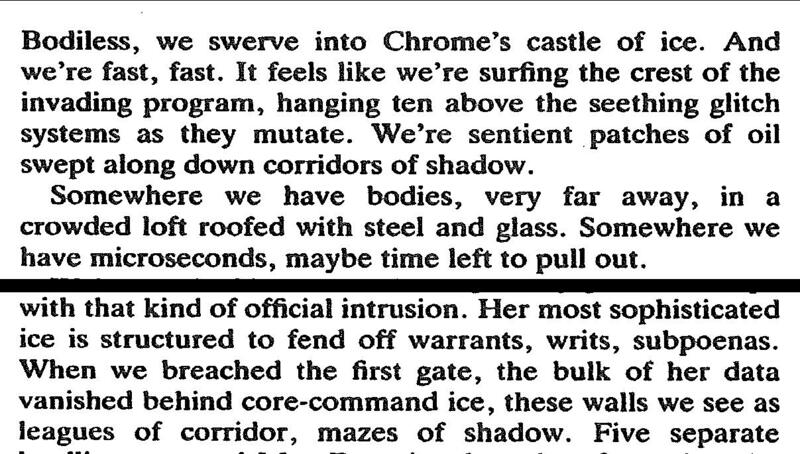 When I went back to re-read the passage, I realized that “ICE” is actually an acronym for Instruction Countermeasures Electronics, which describes Chrome’s ante-hacking software. After reading the passage, I realised that what Gibson meant by “bodiless” was the hackers were figuratively, not physically, moving through the “Matrix” via a computer. “Bodiless, we swerve into Chrome’s castle of ice” = (in my own words) via our computer system we were able to find the coding of Chrome’s ante-hacking program. This journal gives information on William Gibson. This book has many short stories in it. One of them is Burning Chrome by William Gibson.